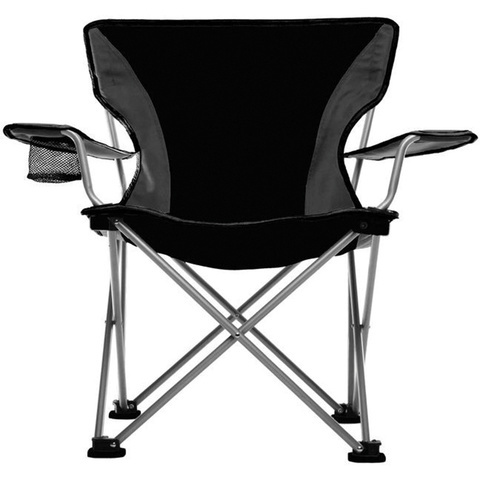 The Easy Rider camp chair offers more comfort with an actual ""V"" shaped back, perfect for those with wider shoulders. The Easy Rider Camp Chair also has padded hand rests, more supple fabric on your backside and adjustable armrests, all making for a more comfortable experience. The unique feet are oversized so that you do not sink into soft ground and also come with a sole similar to gym shoes, that prevent slipping and marring to prevent scratching floor surfaces. Reinforcements include rip stop fabrics at stress points, custom plastic molded grommets and seat belt webbing, oversized rivets and a durable powder coated steel frame.